About Club – Chittagong Club Ltd. In 1875, Mr. W.A Campbell, a well known Tea Planter of that period started a Club which was placed at the disposal of only the tea planters in order to provide logistic service during their stay in the district. During the 1870s, the tea industry experienced a rapid growth, and on 23rd August 1878 Campbell’s Provisional Club was to transform into Chittagong Club, which opened its doors to all European residents of the district, and is now the building situated on the hill near the telegraph office, now known as the Forest Bungalow. In the early 1890s, a new Club House was erected the present location which was known as the pioneer Hill. Originally the site of a tea garden. The land belonged to an affluent landlord of the time, Nityananda Rai Bhahadur, who kindly gave the property to the Club at a nominal charge. At these premises, the Club opened on the 27th March 1901, and went on to be registered as a company on 1908. 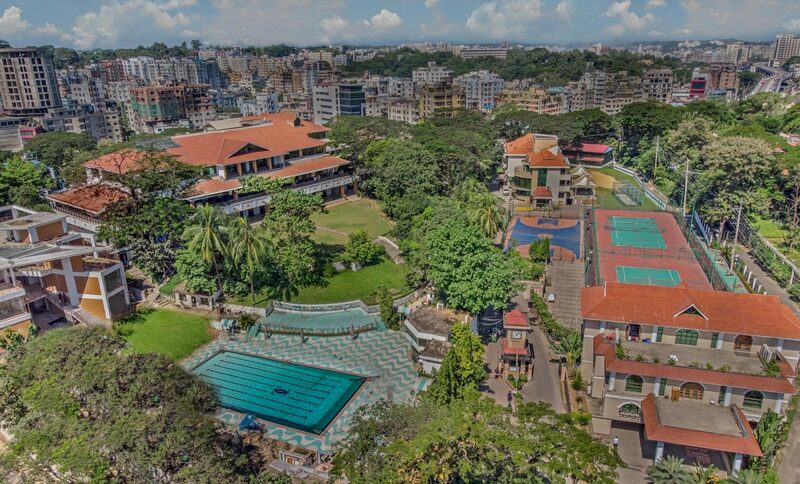 The Ministry of Defense and the Military got the ownership of the entire area and a less in favor of Chittagong Club Limited, for 99 years, was executed by a registered deed effective from 2nd January 1959. With the growth of membership, the new four-storied Main Club House was built in 2012-13, incorporating an ever-increasing number of facilities. Through the ages, it has come to be a family Club where members and their families can enjoy and partake in its array of amenities. The Club continues to uphold its reputation as the foremost institution of its kind in the country.